This “Ultimate Patagonia” Travel Suggestion starts in Buenos Aires and moves over to Patagonia covering both Argentina and Chile and includes some of the most beautiful glaciers and breathtaking scenery you will find in the world. Torres del Paine National Park, Tierra del Fuego, Perito Moreno Glacier and Glacier Grey just to name a view, there is so much to see and experience. There is an overnight stay in the pretty town of El Calafate and the tour ends in the vibrant city of Santiago, Chile. This independent Argentina travel itinerary is a must do for all travellers, the beauty of the landscapes will overwhelm you and gives you the opportunity to one of the most beautiful natural locations in the world! Day 9 – 10 Arrive in Santiago, Chile, City tour in Santiago. Day 11 Depart Santiago for your onward journey / next adventure! Upon your arrival into Buenos Aires you will be transferred from the airport to your hotel. During the short drive you will be able to see the mix of traditional colonial architecture along with a strong European influence. Buenos Aires is laced with great restaurants boasting its renowned prime Argentinean meat with local Mendoza wine, nightclubs, theater, shopping precincts and easy to navigate streets. When you arrive at your hotel you will have the remainder of the day to explore Buenos Aires. It’s a city, which you need at least one afternoon to just walk through the streets and get a real feel for the Argentinean culture and of course, there is the shopping! Argentinians are renowned in the Americas for being incredibly fashionable and edgy with their fashion trends. Overnight Buenos Aires. Included in your packages is a local half-day city tour. Your city tour is 3.5 hours and you will be able to visit the main points in the city; these sights include the famous Opera House, the Colon Threatre and the Obelisk, which is a symbol of Buenos Aires. In the Congress district, you can admire the Legislative Palace, built at the beginning of the 20th century, the Plaza de Mayo (May Square), in the historic heart of Buenos Aires and surrounded by some of the oldest and most important buildings: The Casa Rosada (Pink House), where the government’s executive branch is housed, the historical Cabildo and the Metropolitan Cathedral, where, inside, lies the remains of the General José de San Martín. You will also visit La Boca, a typically Italian migrant neighbourhood, with its colourful houses and the famous Caminito walkway, and a museum of Arts in the open air. Afterwards, there’s a visit to Palermo, the residential district, with its magnificent houses and huge Botanical Park. Afterwards you will visit the wealthy Recoleta district, famous for its cemetery, nightlife, elegant shops and residences in the northern area of Buenos Aires. You will then have the remainder of the day free and to prepare for your dinner and Tango show later this evening. Argentine Tango is a musical genre with a fantastic social and embracing dance to accompany it. Originating in the 19th century in Buenos Aires, it quickly grew in popularity and spread internationally. Tonight we have included a spectacular evening dinner and tango show at one of the leading tango venues. Here you will be able to Taste Argentine cuisine specialties accompanied by excellent wines and finish the evening enjoying a Tango and folklore show. Today you will depart Buenos Aires for the next part of your Argentinean adventure. You will be transferred from your hotel to the airport to board your flight from Buenos Aires to El Calafate (flight not included in package price and will be quoted separately). Once you arrive into El Calafate you will have the remainder of the day at leisure. While this town is renowned for its proximity to the impressive grand Moreno glacier it is also the quaint fresh feel about the town that has you captivated. Take a stroll down the streets and take in some breathtaking scenery and cultural settings. 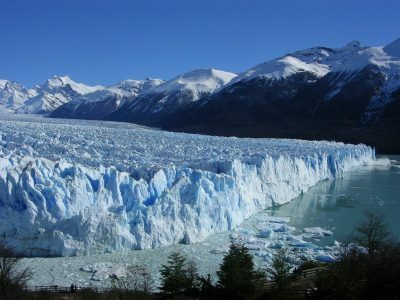 The Perito Moreno glacier is the most fascinating glacier you will ever come across, we have included a full day tour which takes you out to this enormous glacier where you can just stand meters away and hear the ice cracking. Travelling down to the Perito Moreno glacier we travel into the Patagonian range bordering the southern arm of the Argentinean Lake, covering a distance of 80km between El Calafate and the Glacier. We then start travelling down the paths, over the slopes to the face of the glacier and be confronted with one of the most photographed and spectacular glaciers you will ever see. The sheer size of this glacier will take your breath away and if nature has its way, you may be able to see a section of the ice shelf fall down with bellowing spray as it hits the water below and leaving massive ripples. We return to El Calafate late in the afternoon where you can enjoy your last night in El Calafate at your own leisure. This morning your journey continues from Argentina with a transfer to the amazing Torres Del Paine National Park. This journey is approximately 3.5 hours and a shared transfer allows you to be able to stop more frequently as there are some spectacular photographic opportunities en route to Chile. Once you arrive into Las Torres Hotel you will have the remainder of the day at leisure. Torres del Paine is with no doubt one of the most spectacular National Parks in the country and one of the primary destinations of choice when visiting Patagonia. With its populous variety of plants and animals, the National Park was appointed by UNESCO as a world Biosphere reserve in 1978. 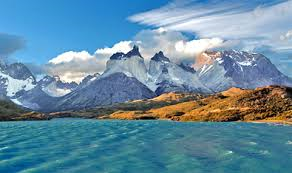 To show you just how magical this area is we have included a full day tour of Torres del Paine. The tour will give you the opportunity to be able to admire the beautiful scenery reflected on the colorful water of Figueroa and Sarmiento Lakes and the typical mountains and heights of the Paine Mountain range formed by Paine Towers, Big Paine, Almirante Nieto Mountain, Indian Head and others. You will also arrive at Hosteria Pehoé located on an island in the middle of Lake Pehoe for lunch. After lunch, we take an excursion to the Grey lake area, visiting waterfalls, the Paine River, Toro Lake, Sarmiento and Grey Lakes. Once at Grey Lake you will be able to sight huge detached glacier blocks of ice floating aimlessly on the lake. The colors of the floating ice blocks will provide the masterly touch to the beautiful scenery created by nature. Once you have returned back to your hotel the remainder of the evening is at your own leisure. It’s an early start today as you check out of your hotel and transfer from Torres Del Paine National Park to Punta Arenas by coach. Once you arrive into Punta Arenas and have checked into your hotel we have included another half day tour to get you better acquainted with this area. This morning your Patagonian adventure concludes and you will be transferred to the airport for your flight to Santiago, Chile. Arriving into Santiago, Chile you will be amazed at the impressive high-rise architecture and modern city life. Located in the center of Chile it is a main gateway to many South American attractions. As with any capital city, it is loud and full of bustle but don’t be put off, this is a city of culture and character aplenty, and home to over 5 million people so you should be able to find everything you need in this modern day city. The hotels we have selected in this package are centrally located and close to some fantastic Chilean cuisine, don’t forget to try out the wine from this region. To understanding and appreciate this underestimated city we have included a morning city tour of Santiago. The tour includes the Bernardo O Higgins Avenue running east west and dividing the city into two main parts; the providencia district and its commercial center Balmaceda park, San Cristobal hill and the metropolitan park, the forestal park. You will also visit the fine art museum, Plaza de Armas with the Cathedral and Town Hall. Further down is the oldest part of the city with uniquely constructed mansions. On the way we will include the exclusive Union Club, the National Library and the central Santa Lucia hill. Overnight Santiago. This morning your insight into Santiago concludes, from here you might like to continue your journey. We would like to suggest going west and see the awe inspiring Iguazu Falls.